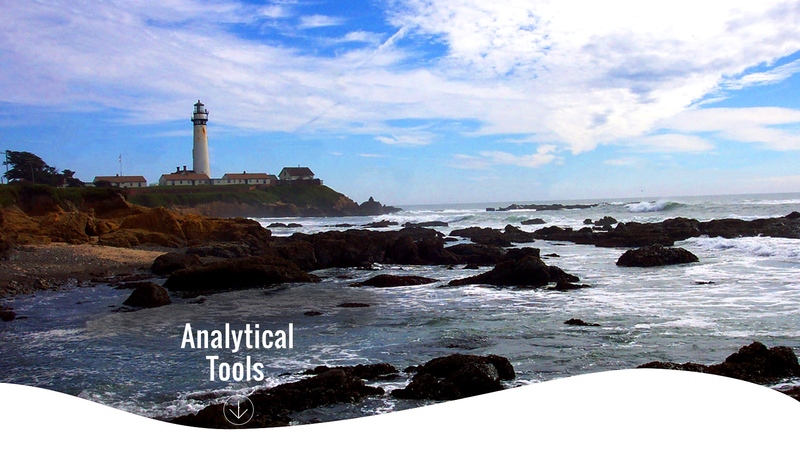 The Ocean Tipping Points team has collected a wide variety of methods for identifying non-linearities or regime shifts in your own system, or early warning indicators of change. In the tables below we distill strengths and weaknesses of the various approaches and point you to where you can learn more. We also provide a set of recommended criteria, approaches, and methods to detect and characterize regime shifts and their driver-response mechanisms, synthesized from the literature. This process can help you to definitively identify non-linear regime shifts in your own ecosystem and characterize their relationships to potential drivers. Based on the tools identified above and criteria outlined by Bestelmeyer and colleagues (2011) and Collie and colleagues (2004) we have put together a suggested process for detecting and characterizing regime shifts and their driver-response mechanisms. Below you will find a step-wise process meant to help guide you through the best available criteria, approaches, and methods to detect and characterize shifts in your own system. This process has been synthesized and adapted in large part from Scheffer and Carpenter 2003, Collie et al. 2004, and Bestelmeyer et al. 2011. 1. Is there a discrete step function or intervention in the time series? A significant step is a necessary condition for a regime shift. However, the type of regime shift cannot be inferred from time series alone. Select driver and response variables based on system-specific analysis, literature review, and expert understanding of ecosystem dynamics and analyze temporal patterns in these variables. Locate and statistically test one or more breakpoints in response variable time series data. Researchers should hesitate to infer response mechanisms based solely on the presence of threshold patterns in biological response variables; analyses of driver-response relationships provide stronger tests of such inferences. Detection of one or more breakpoints suggests that an abrupt transition may have occurred. 4. Does the system switch to an alternative state when perturbed? Assuming that the forcing variable is known, the system should switch states when this variable changes. A positive answer to this question indicates a discontinuous regime shift. 5. Does the system have a different trajectory when the forcing variable increases, compared to when it decreases? If yes, this is evidence for hysteresis and the existence of a discontinuous regime shift. De'ath, G. (2007). Boosted trees for ecological modeling and prediction. Ecology 88, 243-251. Fox, J., Nie, Z., Byrnes, J., Culbertson, M., Debroy, S., Friendly, M., Jones, R.H., Kraner, A., and Monetter, G. (2015). SEM: Structural Equation Models [Online]. Available: http://cran.r-project.org/web/packages/sem/sem.pdf [Accessed]. Guisan, A., Edwards, T.C., and Hastie, T. (2002). Generalized linear and generalized additive models in studies of species distributions: setting the scene. Ecological modelling 157, 89-100. Hampton, S.E., Holmes, E.E., Scheef, L.P., Scheuerell, M.D., Katz, S.L., Pendleton, D.E., and Ward, E.J. (2013). Quantifying effects of abiotic and biotic drivers on community dynamics with multivariate autoregressive (MAR) models. Ecology 94, 2663-2669. Hare, S.R., and Mantua, N.J. (2000). Empirical evidence for North Pacific regime shifts in 1977 and 1989. Progress in Oceanography 47, 103-145. Hastie, T., and Tibshirani, R. (1990). Exploring the nature of covariate effects in the proportional hazards model. Biometrics 46, 1005-1016. Holmes, E.E., Ward, E.J., and Wills, K. (2012). Marss: Multivariate autoregressive state-space models for analyzing time-series data. The R Journal 4, 11-19. Ives, A., Dennis, B., Cottingham, K., and Carpenter, S. (2003). Estimating community stability and ecological interactions from time-series data. Ecological Monographs 73, 301-330. Matteson, D.S., and James, N.A. (2014). A nonparametric approach for multiple change point analysis of multivariate data. Journal of the American Statistical Association 109, 334-345. Rodionov, S.N. (2006). Use of prewhitening in climate regime shift detection. Geophysical Research Letters 33. Thrush, S., Hewitt, J., and Lohrer, A. (2012). Interaction networks in coastal soft-sediments highlight the potential for change in ecological resilience. Ecological Applications 22, 1213-1223. Veraart, A.J., Faassen, E.J., Dakos, V., Van Nes, E.H., Lürling, M., and Scheffer, M. (2012). Recovery rates reflect distance to a tipping point in a living system. Nature 481, 357-359.